a bounty from the field & vine comes the prize. and days of softer sunlight. with a luster of pleasant earth tones. The Harvest Moon is upon us ! amber-like hue and become a cooler white, seemingly without haste. Cognac, Champagne, and Light Cape. Centered and encircled by sterling silver, the silhouettes of birds in flight are back-dropped by an iridescent mother of pearl “full moon”. The majority is fabricated in 14 karat rose gold, with “twists” of yellow and green golds. 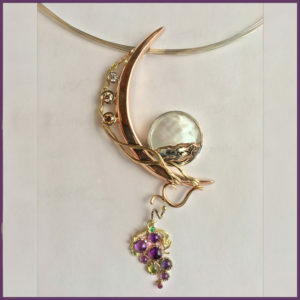 The additional (and optional) grape cluster pendulum is created from 18 karat green gold with a variety of gemstones stipple-set in 18 karat white gold. The gemstones include: amethyst, iolite, peridot, emerald, and a purple diamond. * All prices listed are subject to change without notice - please call for current jewelry prices. There are endless qualities of diamonds available on the market. One way of insuring you are receiving the quality you are purchasing is to request a certified stone.